Joyce and Wordle: "A Few Wellchosen Words"
Now that James Joyce's literary corpus is finally in the public doman, I've decided to appropriate it in a singularly 21st-century manner: by readingUlysses chapter by chapter in Wordle, which creates cloud-like infographics based on how often individual words recur in a given text. Visual concordances, more or less. Each chapter of Ulysses is remarkably different—scholars have noted that chapter breaks serve to shift from one style to another, rather than from one pivotal moment to the next—so I loaded each one into Wordle, let it remove the most common and pedestrian words, and screen-grabbed the results. Here are a few stray observations on the first three chapters, in which Stephen Daedalus's world is fleshed out before Leopold Bloom's arrival. 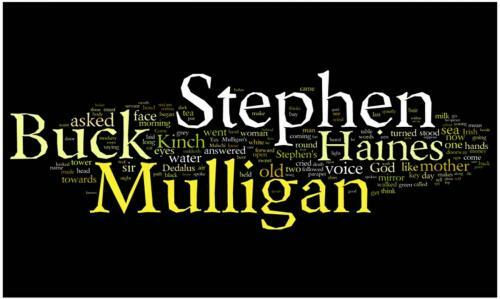 Stephen Dedalus (nicknamed Kinch) is talking to his roommate Buck Mulligan in the Martello tower they're both sharing. "God" is mentioned just as often as "mother." The sea and water crop up plenty; the tower is out by the shore, after all. "Mirror" is another popular one, starting with the first line: "Stately, plump Buck Mulligan came from the stairhead, bearing a bowl of lather on which a mirror and a razor lay crossed." But it's surprisingly renamed in one of Stephen's most famous aphorisms: "It is a symbol of Irish art. The cracked looking-glass of a servant." 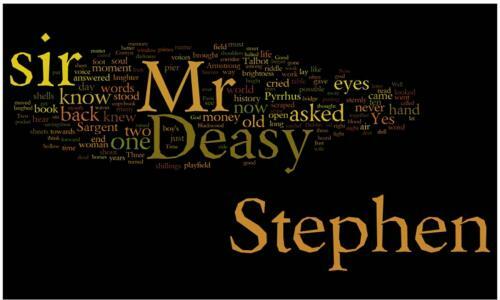 I've rearranged the words here to keep "Stephen" separate from everything else, since this chapter focuses on Stephen's job teaching, as well as his uncomfortable relationship with the elder Mr. Deasy. There is a great deal of authority and deference in the classroom and in the office: "yes," "sir," and the verbal conjugations of asking and knowing and crying and answering. The word "history" is hidden but memorable here, just as important as books and, ironically, even more recurrent than God: "For them too history was a tale like any other too often heard"; "All human history moves towards one great goal, the manifestation of God"; (best of all) "History, Stephen said, is a nightmare from which I am trying to awake." Stephen's name is all but swallowed up in this chapter, which ditches its protagonist for the "ineluctable modality of the visible." Instead of names, there are his eyes and the sand, everything to see beneath his feet and behind his back. Of all the German words, "nebeneinander" (n:coexistence; adj: in parallel) is the only one frequent enough to appear here. "God" is again recurrent, but not nearly as much as "Paris" or "woman." Everything here boils down to immediate perception and thought, from the concrete elements of the sea and the shore to the clearly abstract mental verbalizations of that which is ineluctable. I've already read Ulysses once, in an eight-day marathon as a bet with my friends, and while I enjoyed the shifts in perspective the first time around, I wouldn't have thought that the words would mark it out so clearly. I also hadn't thought about Ulysses in religious terms, so seeing the relative prominence of the word "God" in each chapter tells a story I hadn't noticed before. Cool stuff. If nothing else, with word-clusters like "God Like Mother," "Look Back Sargent," "Eyes Going Kiss," this thing's a band-name factory.